What makes an English garden design so lovely? These types of gardens are a mix of both formality and informality and typically are filled with colorful perennials. 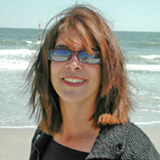 The landscape design is usually made up of straight, wide walkways. On one or both sides of the walks are very beautiful flower gardens. They are full, lush and colorful. While they seem to be created in a disorganized fashion, I think this is far from the truth. The beauty is that they are just made to look this way! Much thought goes into heights, color, positioning and quantities for the end results. There might be a bench along the way or you might come upon a pretty sculpture. Sometimes there is a beautiful focal point. Many of the gardens are along walkways, but others are enclosed to form "garden rooms". The walls of these rooms may be plantings or actual walls made of brick or stone. Regardless of which is used, they are tall as a wall might be. Read about Sissinghurst below. One interesting feature used in England is that of a tapestry hedge. Here, the wall is formed by tall plants to form a sheered hedge, but the plants vary from each other. There might be Boxwood, Hornbeam and others. Over time, the greenery of the plants actually weave together to form the "tapestry". This is quite creative and beautiful, although it takes a lot of patience and maintenance to get the full benefits. Can you imagine all the trimming that needs to be done?! 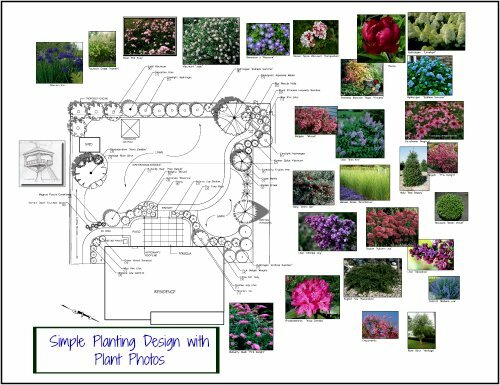 English garden design can be a challenge both in the creation and the maintenance. Perennials should be planted with thought to how the texture of one type looks with another. There should be a thought out color scheme. Place lower plants in front of taller ones, but ignore this in some areas so that the design is not completely uniform. Although perennials will return year after year, they do need up keep, such as removing spent flowers and any yellow leaves. In addition, they must be cut down to about 2 - 3" once a year to allow for the next season's new growth. When creating this type of design, try to keep the depth of the bed in mind. The wider the better since you can than have lots of layers of different perennial flowers. 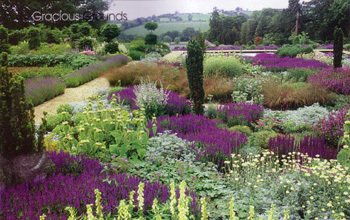 Notice how wide the bed is in the above perennial design photo? I have visited many gardens in England, some of the more noteworthy being Hidcote, Snowshill, Sissinghurst and the gardens of Rosemary Very. I would say, with the exception of Snowshill, they all have a similar garden feel to them. 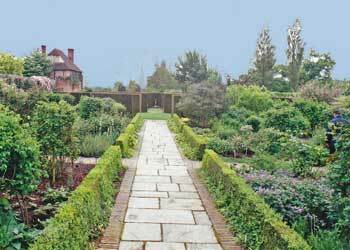 Sissinghurst has beautiful gardens and the residence itself is absolutely charming. 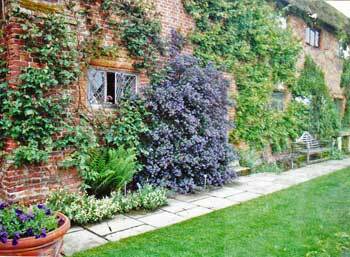 The brick house is covered with climbing plants and the front plantings are very cottage-like, as shown in this actual photo. 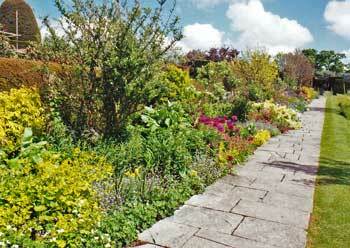 The gardens are of typical English garden design, with geometric walkways and flowering gardens. These two garden photos are from Sissinghurst, which I took during my trip there. Snowshill is a secluded village in the famous, charming Cotswolds, with ancient pretty cottages and a 19th century church clustered around a small green. You certainly feel as if you have walked into another time. Snowshill Manor is a Tudor mansion with a medieval like priest's house on the property. What impressed me here was the landscape of rolling hills scattered with sheep and the view into the far distance....all set among the charming village.